They chose an existence behind towering walls, a spiked, steel grille, and solitary prayer and absolute poverty while living away from their friends and families never to be seen again by a member of society. As members of the Order of the Discalced Carmelites these sisters turned away from the world to take up His Cross, a commitment of complete Faith, and one full of prayer for folks they would never, ever meet face to face. The Carmelite Order was the strictest of all female religious orders, and self-flagellation accompanied a mission of prayer while belonging solely to Jesus Christ. 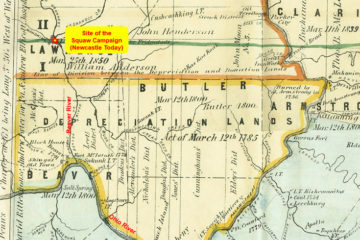 The Carmelites, named after Mount Carmel in Palestine, first arrived to America in 1790, when they settled in Fort Tobacco near the city of Baltimore. 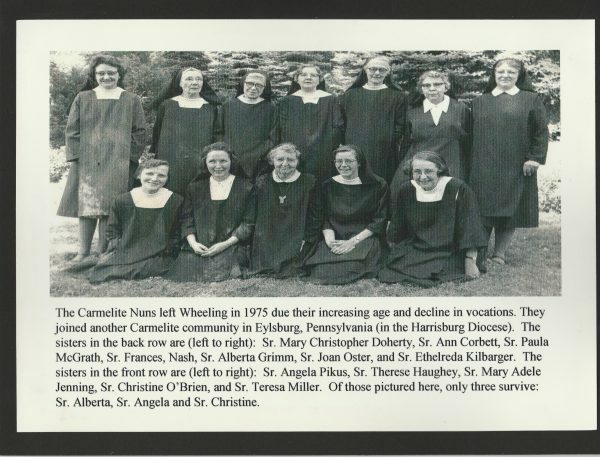 In the early 1900s, Bishop Patrick Donahue of the Wheeling diocese requested the Carmelite sisters come to Wheeling, and four nuns from the Baltimore and Philadelphia areas arrived in 1913. 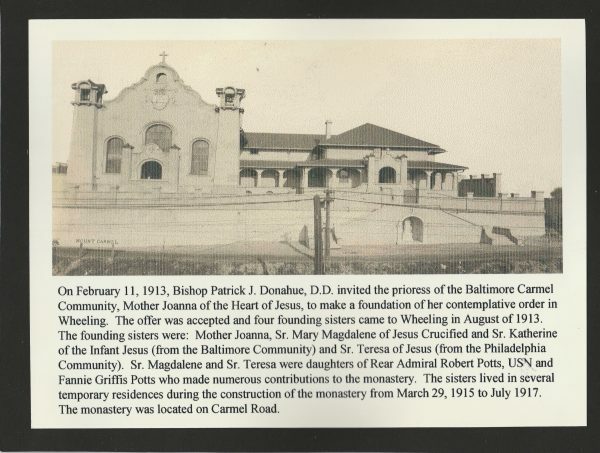 After initially settling in the Fulton area of the Friendly City, the sisters moved to the Goshorn Estate, which was located on the same hillside where the Mount Carmel Monastery would be constructed by Frederick Farris beginning in 1915. Two years later the monastery was complete, and the Carmelite sisters had their home and were secluded for the rest of their respective lives. 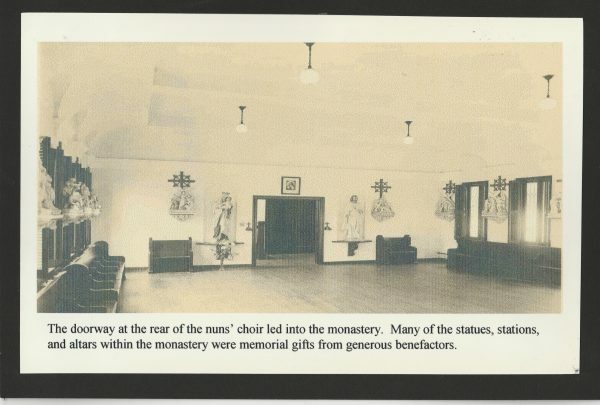 Up until the early 1960s the only portion of the Mount Carmel Monastery the public was allowed to visit was the public chapel, but the nuns had their own, and the two areas were the only rooms that were permitted to be beautiful out of respect to The Lord. The Carmelites attended formal prayer sessions beginning daily with 7:30 a.m. Mass, Angelus at noon and again at 6 p.m., and devoted prayer at 4:30 p.m. and at 9:30 p.m. It was their vocation, one the sisters accepted after living at the monastery for more than a year before taking their vows. They understood the only way they could accept the public’s donation was by turn-wheel that concealed their identify from the rest of the world. Today, there remains only one surviving Carmelite sister who lived and worshiped behind the tall walls of the Mount Carmel Monastery. The original front door of the monastery remains in place today. Practicing the mortification of the flesh for religious purposes was adopted often inside Catholic monasteries and convents throughout the history of Christianity, and that is why self-flagellation was a practice of penance inside Mount Carmel. The sisters would whip themselves over the shoulder during private prayer most often using cords that were knotted several times. It was a part of removing themselves from the distractions of society and entering into the cloister to devote themselves to a search for God because they believed their union with The Lord benefited the lives on the other side of those walls. “The Carmelite sisters were essentially closed off from the rest of the world. 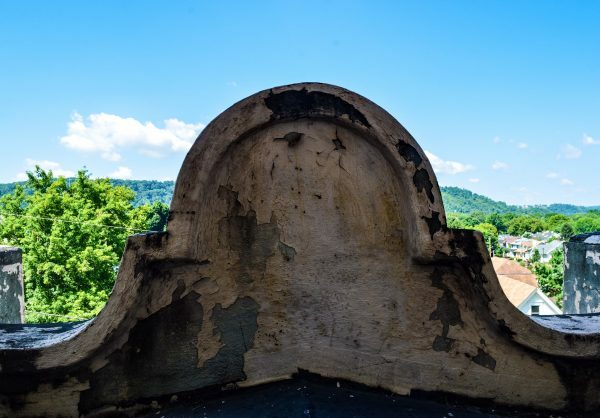 They lived behind the grille and in solitude with no exemptions except for being allowed to seek medical attention inside the monastery,” explained Jon-Erik Gilot, the director of archives and records for the Diocese of Wheeling-Charleston. 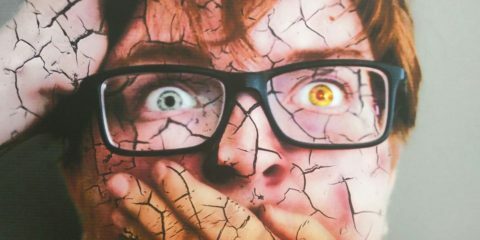 “On one side of the grate there spikes that were sticking out from it, and I believe the spikes were there to keep them from getting too close to the outside world. It was all about solitude and prayer. The travel chalice was used on the ship that brought the first Carmelite sisters to America in 1790. A Jesuit priest would celebrate a private Mass for them below deck, and the sisters were dressed like men during the trip. 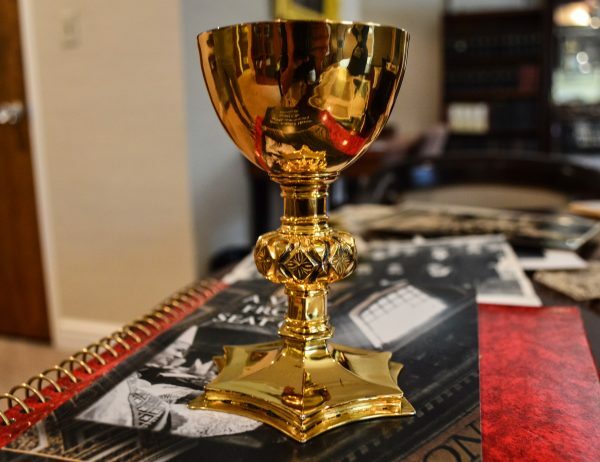 The chalice then was donated to the Wheeling Carmelites in 1920 by U.S. Sen. Eugene Moxley. St. Michael Church and the school on National Road near Washington Avenue have long rested in the shadow of the monastery, and the student body was taught about the mission of the Carmelite sisters through the 1970s. 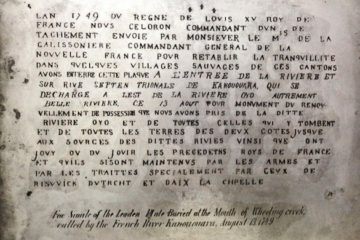 Those pupils, too, heard the legends of caves and tunnels and other alleged secrets of the order. 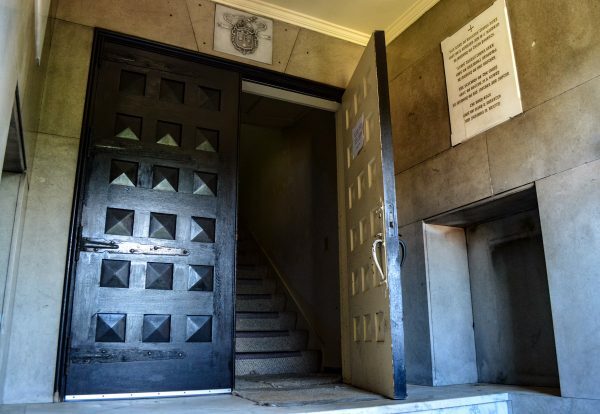 While Gilot acknowledged the existence of prayer shelters scattered on the Mount Carmel property that were used by the sisters, he has gathered no records that indicate any underground passageways. “Because the Carmelite sisters were cloistered, I believe there was some fear and a lot of misinformation that was spread through the community,” he said. “Plus the monastery looks like a daunting place, and they were as strict as it comes, and they lived a Spartan life until Vatican II. While the Carmelites were cloistered, the order did come to retain a “tern sister,’ who would handle any public dealings like greeting visitors, retrieving supplies, and answering the monastery’s telephone. She was their one and only link to the outside world. It was a conducted re-evaluation of the Catholic Faith that took place under a pair of pontiffs (John XXIII and Paul VI) during the early 1960s, and Bishop Hodges represented the Diocese of Wheeling Charleston and sent letters every two weeks for the local newspapers to publish. The results of Vatican II altered the practices of Catholicism forever because the rules were relaxed considerably. For example, the Carmelite sisters suddenly could travel beyond those walls. “From 1962 to 1965 all of the bishops and archbishops were called together to make the Catholic Church closer to what we know today,” Gilot said. “A lot of things changed, like before then the priests used to celebrate Mass with their backs to the people in attendance. Vatican II brought the Catholic religion to a more modern-day religion. Although many believed Vatican II would attract more vocations to the Catholic Church and to the Mount Carmel mission, the numbers continued to decline. The Wheeling Carmelites began searching for a new home in the early 1970s, and the structure was sold to private ownership in 1975. “The sisters made the decision, and it was based on the lack of vocations,” Gilot said. “Sister Angela Pikus was the last vocation there, and I believe she may have entered in 1959 and took her vows a few years after that. So they went for well over a decade with absolutely no new vocations to speak of. 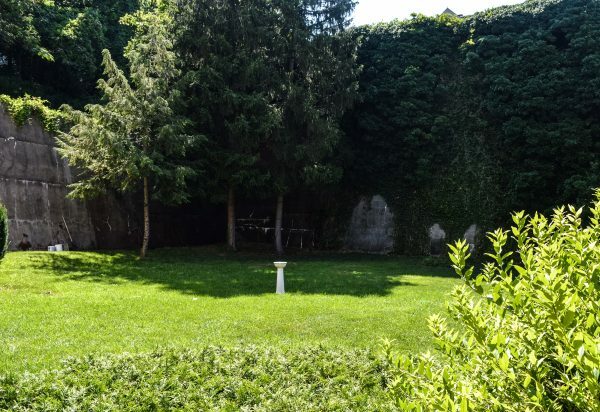 The nuns who passed away while at Mount Carmel were initially interred on the monastery property but have since been moved to the cemetery near the former site of Mount de Chantal Visitation Academy. There is only one Wheeling Carmelite, who lived and prayed in the monastery and whose heart persists to beat, and Gilot has met the lone survivor, Sister Angela Pikus. “A few years ago I started receiving letters from her about some of the artifacts that she was still in possession of, and then she told me to come get them because she wasn’t getting any younger,” he explained. “She now lives in a religious community that includes people from all kinds of religious orders, so her life today is much, much different than it was when she was at Mount Carmel. 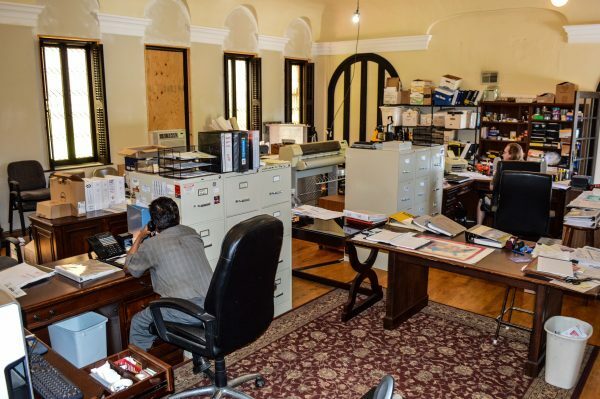 One large room is now the offices for Valley Engineering. 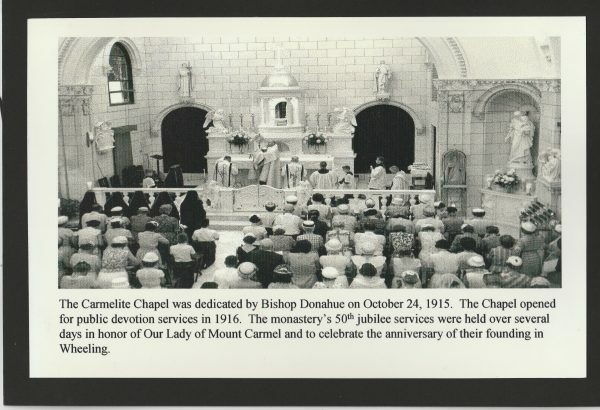 The Mount Carmel Monastery has not been the same since being sold to a private owner, and the structure has changed hands more than a few times since the Wheeling Carmelites surrendered the property. An abandoned community coal mine has caused water issues for the landowners, and for periods of time the building has sat empty with tarped sections of roofing. 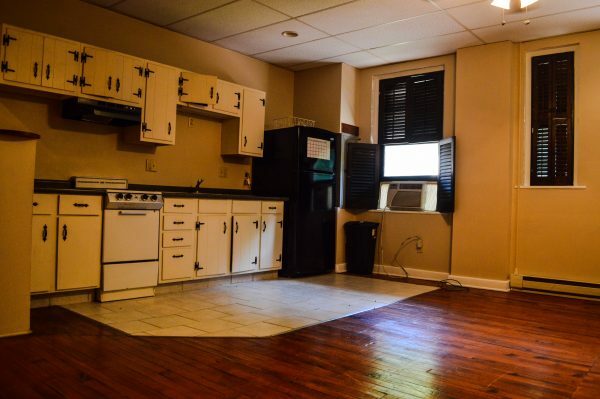 Most often, though, it’s been utilized as an apartment building for college students and working professionals. But today, the stained-glass windows are gone, and so is the turn-wheel, all removed by owners previous to its current curator, Suki Gupta. And now, Gupta, the owner of the Valley Engineering Co., plans to orchestrate an extensive preservation and renovation project. He has retained the services of the Property Management Division of Harvey Goodman Realtors, a local company that is one of the leading management firms of historical properties in the city of Wheeling. One of the many “eyebrows” on the structure. There are now 13 apartments and eight “dorm room” areas in the former monastery, and Hagan already has started the orchestration of Phase I. “There are three major projects that will take place here at this property, and the first will involve anything we consider the most important because those areas are where the most deterioration has taken place,” Hagan said. “That part will begin with the chimneys, the building’s eyebrows, and the parapets. All of that is expected to begin this week and we have hired Sarel Venter to perform that work. The apartments all have been renovated. 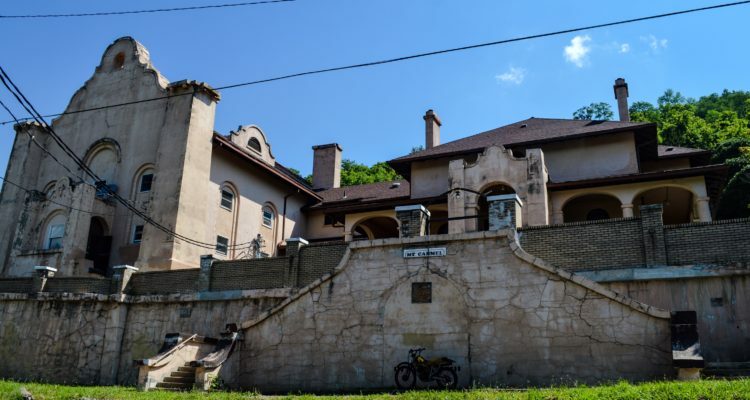 Gupta will receive tax credit for preserving the Mount Carmel Monastery, but more such projects in the Wheeling area, Shortall insisted, could take place in Wheeling’s future. 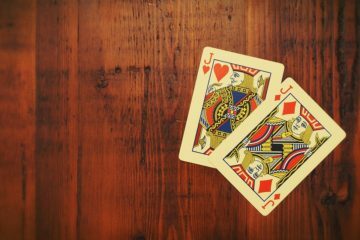 That depends, however, on whether or not West Virginia lawmakers consider and approve altering the possible amount for tax-credit involved investments. 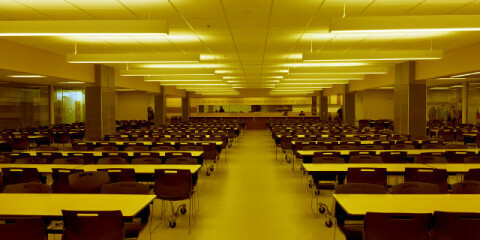 “We are working with several consultants on tax-credit projects including this one,” the property manager said. 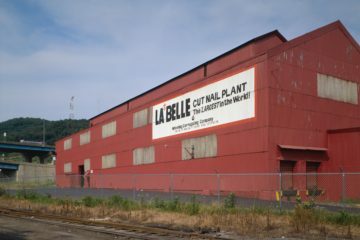 “There are many buildings around Wheeling that are eligible, and we are working with a group of investors that is very committed to invest in Wheeling. Should we be able to get the tax credits from 10 percent up to 25 percent, we could see a lot of projects take place in this area. 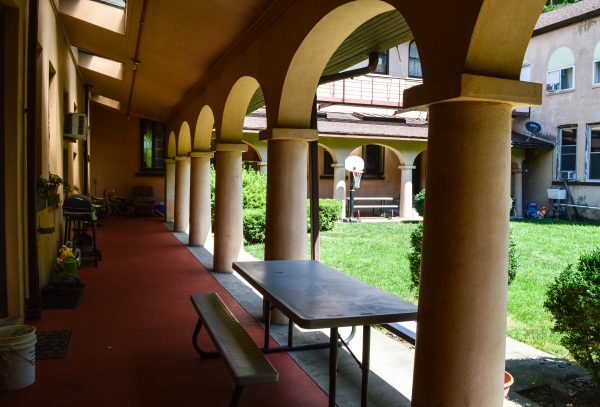 The courtyard is lined by a long porch. Shortall and Hagan have engaged W.Va. Dels. Erikka Storch and Shawn Fluharty, and the firm may take an additional proactive step when the time arrives for the Legislature’s regular session in late January. The courtyard is surrounded by a tall retaining wall. “We already addressed our local lawmakers, but with what has taken place in Charleston recently, this issue has been at a standstill,” Shortall reported. “And with the flooding in a lot of parts of West Virginia, everything really got put on hold, and that’s very understandable. And we’re fine with that because they need to do what needs to be done for those people. I cannot read of the potential good fortune for the Carmel Monestary without a still raw wound being opened yet again. Why oh why could not this interest and following action not have been taken on behalf of Mount de Chantal Visitation Academy? There were those who tried to save the building…valiantly working to communicate at every level, with the Historical Society, the State Historical Site Commission, we had a current and valid study’s done by an historic buildings scholar and architect, offers of financing, pleas to the Diocese and a body of willing, able and educated alumnae and others ready to go to work to save that beautiful building. We got nowhere. Where as I wish those individuals involved in the preservation efforts all the best I can’t help feeling sad and frustrated at the loss of Mount de Chantal. 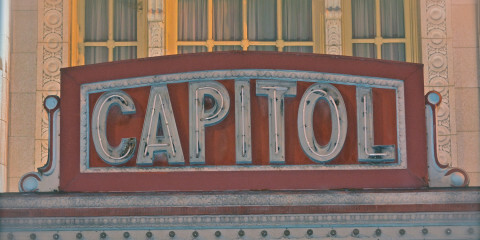 Could it really be the lack of tax credits? I don’t think so. I believe the reason Mt. De Chantal wasn’t preserved is the Diocese has other plans for that property. I appreciate all the information which brings back many memories of Wheeling . I was an alter boy at St. Michaels in the mid 1960s and we would occasionally be assigned to serve mass at the monastery. There were a few public people, but the nuns sat behind the large iron grate, and there was a black gauze curtain behind the grate. The priest would serve communion through a little slot in the grate. I also worked in the yard several times when I was 12-13 years old, I remember they had a pretty good garden, and the only one who spoke to me was the mother superior. That was a great story about the Carmelites. But, they still exist. 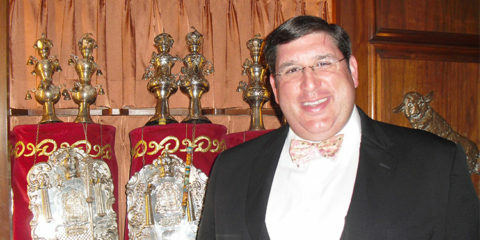 Matter of fact, there are two monasteries around the New Orleans area, of which, I am associated with (Discalced). I will pray that the tax situation is resolved in your favor. I am from Wheeling and love to see any thing that restores it’s beauty. I have really enjoyed reading this short history of The CARMELITE COMMUNITY in Wheeling. Even though the property has been sold to private owners. Anything native which is so sacred to this holyorder of The Church. Should by all means be preserved in some way. THE MONESTERY was located in a section of wheeling which has had great prosperity and home to the QUEEN OF THE CROP of our diocese, ST. MICHAEL’S CHURCH. Silent cloistered prayers that the nuns prayed daily were heard by our GOD. I will be praying for Mr. Gupta’s. Project of restoring or salvaging any sacred. Reminders of these holy nuns! A fervent, elderly Catholic relative often opined that Wheeling’s slow decline was greatly exacerbated when the Carmelites left town. The nuns were here hidden but nestled among us ardently praying for the community day and night. That thought returns to me every time I pass by old Mt. Carmel as I’m running my errands. 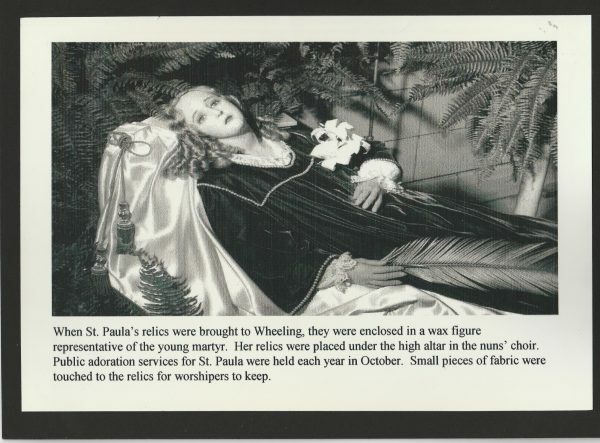 Maybe the “resurrection” of that monastery will once again somehow spiritually entwine with Wheeling’s resurrection. In the 1940’s and 50’s my grandfather, Dr. Mayes Williams, was the doctor allowed inside for medical reasons. His home was on Bae Mar Place so he lived nearby. The sisters did do stitchwork as mentioned in the article and they gave him two quilts as a thank you. One was yellow and white and the other was pink and white. He gave them to me and my twin sister and we used them for many years on our beds. 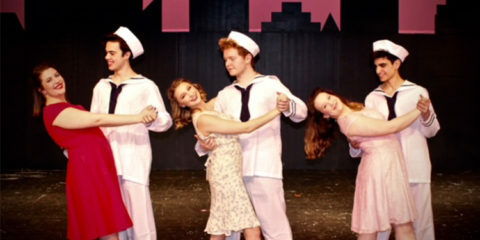 We lived in Highland Park near Elm Grove. 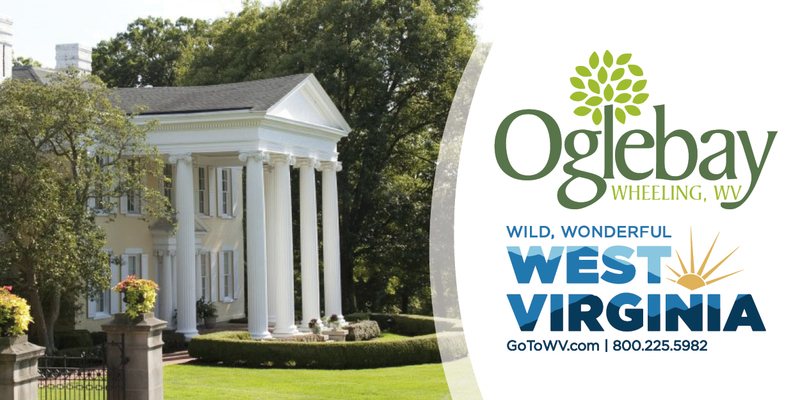 Dr. Williams went on to be Medical Director of the Ohio Valley General Hospital until his retirement in the 1960’s.